While faith in government continues to nosedive, public trust in the media and business worlds is on a high in Australia, bucking a trend of growing distrust around the globe. According to Edelman’s ‘2012 Trust Barometer’, trust in the media has improved 11% and trust in business is up 3% over the past year among what the PR agency calls ‘informed publics’ – high income, university-educated Australians who consume media and follow public issues. These informed citizens – represented by a sample of 200 respondents – were found to place greater trust in all institutions than the general Australian public which was also surveyed as part of the study. According to general manager of Edelman, Grant Smith, trust is important as it demonstrates the level of comfort stakeholders have in their dealings with institutions or businesses. “Trust is an important determinant of people’s willingness to pay for premium products; you’re more likely to pay the money for products or services that you’re more confident in,” Smith says. Growing distrust towards government is not unique to Australia, with trust levels experiencing a drop for 13 of the 25 countries surveyed, and the media ranking above the government in nine countries around the globe. 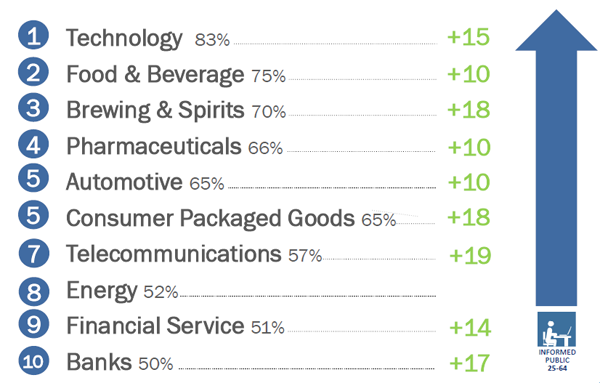 Across different industries trust was fragmented with technology, food and beverage, and brewing and spirits ranking at the top of the trust scale and banks, financial services and energy companies at the bottom among the informed publics group. 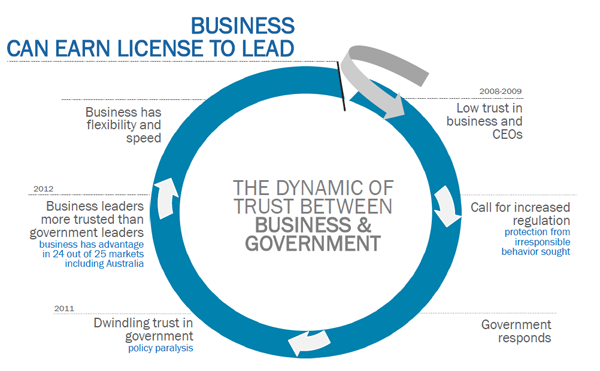 Government leaders are less trusted than business leaders – in Australia 60% believe business leaders tell the truth, compared to only 40% who place stock in the word of government leaders. While CEOs experienced a decline in perceived credibility over the year (down 8% to 41%), Edelman believes the elevated standing of business leaders relative to government leaders gives business a ‘licence to lead’ in society rather than just a licence to operate. In its annual trends report, JWT Intelligence anticipates a rise in corporate social responsibility programs that emphasise shared value between businesses and communities. According to the report, “Rather than simply doling out cheques to good causes, some corporations are starting to shift their business models, integrating social issues into their core strategies. The report gives the example of a partnership brokered by Phillips with the Dutch government to provide sustainable energy solutions to the 10 million people in 10 sub-saharan African nations by 2015. 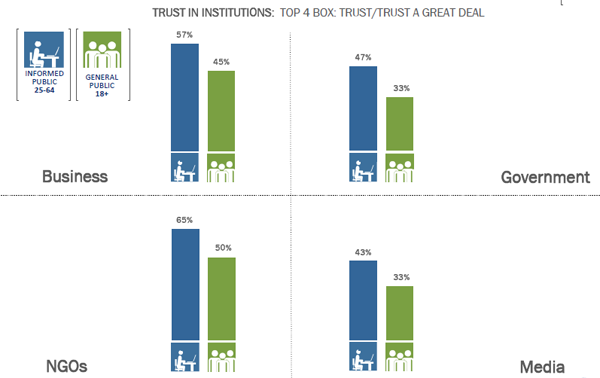 While Edelman’s report may play down perceptions of corporate greed and cynicism towards government and media by focussing on a wealthier, more educated group in society (one which makes up less than 25% of the population), it makes interesting points on the future importance of trust as a requisite building block for successful institutions.